The ‘Port Waste Catch Shoreliner’ project has been voted Most Sustainable Port Project in Rotterdam (the Netherlands). The Shoreliner is a collection system developed by Tauw that captures, removes and recycles floating plastic in the Lekhaven. 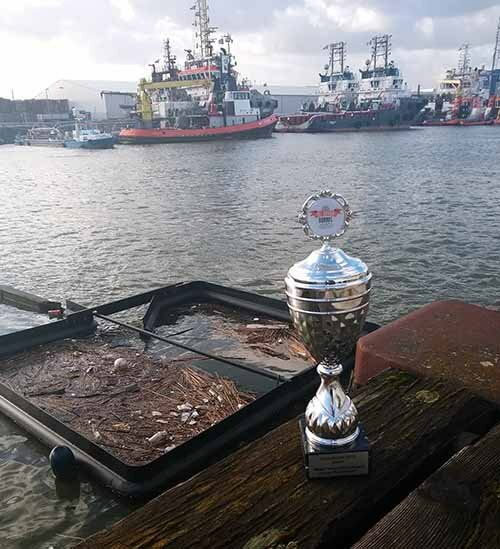 ‘"We are delighted to receive this award and are especially proud that our industry peers from the port voted for us", states Tauw colleague Remco Pikaar. The Shoreliner is a capture system that reduces the amount of plastic in rivers, seas and oceans by sustainably catching floating plastic waste, removing it, and then recycling it. The data that is collected with the capture, measurement and sorting of the floating waste may be shared on request. This data is also used to gather and share knowledge and shape policy around the issues related to plastic soup. Tauw developed the Shoreliner for the Port of Rotterdam Authority, Rijkswaterstaat and the Tauw Foundation. The Shoreliner was improved several times over the course of time: its construction is now more robust and the capacity has been enlarged. In addition to capturing plastics, the Shoreliner is also a good tool for monitoring both macro and micro plastics (so-called nurdles) in surface water. By collecting this data over several years, it can be determined how big the problem actually is and how effective the measures against plastic soup actually are. Several Shoreliners are currently being developed in the Netherlands. More information about the Port Waste Catch project can be found on the website of the Port of Rotterdam Authority.